It’s hard for we moderns to believe, but a time did exist before the invention of the domestic electric refrigerator. In those days, which were less than a century ago and comprise the vast majority of human civilisation, most households grew food and almost all knew how to preserve an abundance of produce. I can’t quite figure out, however, the three types of pickle most people are familiar with are olives, onions and the most famous of all, cucumbers. The latter has been popular throughout Europe for centuries, and is now so synonymous with the idea of pickling that you’ll find sliced pickled cucumbers on burgers in fast food stores worldwide. These industrialised pickles aren’t a shade on the kind of pickles you can make using organically grown produce from your garden. Homemade pickled cucumbers are delicious, easy to make, can be preserved using a range of techniques, and best of all, make the most of what is usually an incredibly productive crop. Cucumbers are renowned heavy bearers. They’d have to be one of the most bartered vegetables of all time, but instead of giving away fresh cucumbers to people who may already have plenty, or who are currently sick to death of the things, why not transform them into something wonderful using a recipe tweaked as your own. Making a basic pickle is almost as easy as falling off a log. Seriously, all you need to do is stuff whole or sliced cucumbers into sterilised jars, make a pickling liquid, and pour it into the jars to cover the fruit. The subtleties come in the ingredients used to make your liquid. Most recipes call for a mix of salt, sugar, water and vinegar, to which you 35 can add spices such as cloves or peppercorns and herbs such as dill. To 750ml (3 cups) of water add 125ml (1⁄2 cup) of white vinegar, 2 tablespoons of salt, 1 tablespoon of caster sugar, 2 teaspoons of black peppercorns, and half a cup of dill leaves. Bring to the boil, pour over cucumbers packed into sterilised jars and seal tightly with a lid. Set aside for a couple of weeks to let the flavours enhance before eating. Refrigerate after opening. An alternative pickling method is lacto- fermentation. This technique uses acids produced in the fermentation process to preserve the fruit, and has the added benefit of being probiotic and great for gut health. Make a simple brine from 1 tablespoon of salt combined with 500ml (2 cups) of boiling water, allow to cool, and then pour over cucumbers stuffed into a sterilised jar. Loosely cover with a lid, then leave the jar on the kitchen bench for a week or two until the flavour has reached the level of sourness you prefer. Screw the lid on tight, store in the fridge and eat after about a month. Easy and delicious! 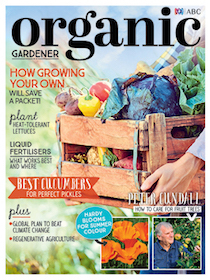 For more on growing cucumbers, grab Organic Gardener Issue 99 OUT NOW!